The Mila Chair is designed and produced in the inner city Melbourne suburb of Richmond by award winning designer Franco Crea. The Mila Chair is part of the Mila collection that also includes the Mila Table. This chair is classically proportioned and is available with or without armrests. The complexity of the concealed fixing details found on the back rail gives the backrest the magical appearance of levitation. The Mila Chair is can be upholstered in Verona Leather, Instyle Feel and Atelier Velvet. The Mila Chair by Franco Crea is on display at the Catapult Design showroom Monday to Friday from 9am to 6pm at Unit 6, Level W2, 42 Wattle Street, Ultimo. Franco Crea is a unique, intelligent, and trusted designer within the high-end Australian furniture industry. Further to his established furniture products, FrancoCrea also offers his flagship custom commissioned designs; from loose furniture pieces to comprehensive joinery projects. The individuality of these projects truly underpins the distinctiveness of a FrancoCrea design. Building strong relationships with manufacturers and incorporating them into the design process is something Franco feels is key to him being able to deliver his designs without having to compromise. All FrancoCrea pieces are designed in-house. They are distinct, contemporary, and capture elegance with acuity. Franco Crea’s passion for design is coupled with a commitment to environmental, social, and economic sustainability. Franco Crea’s locally designed and made products can be purchased on The Local Project’s Marketplace which showcases and promotes the very best in local Australian furniture and product design. Franco Crea’s products can also be viewed at the Catapult Design showroom located in Pyrmont, Sydney. The lead time of the Mila Chair designed by Franco Crea is 6-8 weeks. 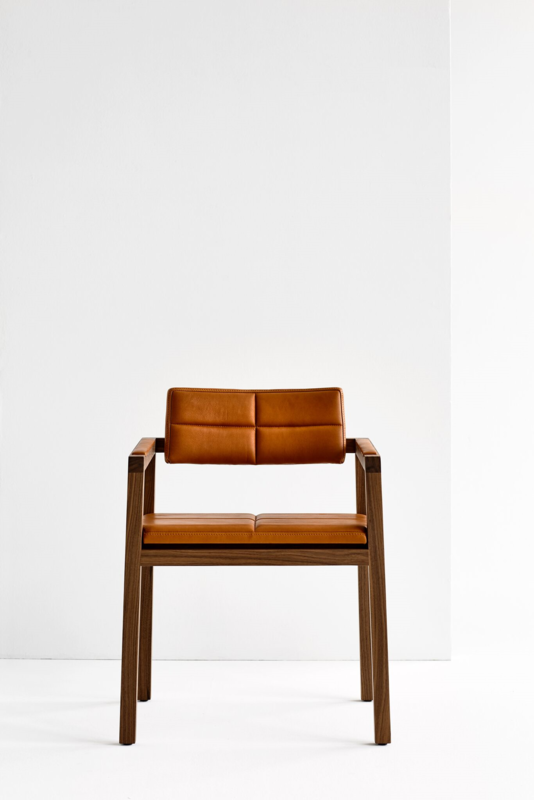 Custom materials and finishes for the Mila Chair by Franco Crea are available on request. This member of the Mila range is available with or without armrests. The Mila Chair is available in American Oak or Walnut and can be upholstered in a wide range of in-house leather or fabrics. The Mila Chairnby Fraco Crea comes with a 3 year structural warranty that shall apply for custom made furniture subject to domestic and commercial use. Franco Crea guarantees the quality of his design and workmanship, of all products, and expect them to provide a lifetime of enjoyment. This covers faulty workmanship in furniture that is subject to normal domestic or commercial application and which has been carefully maintained and sensibly used. During the warranty period FrancoCrea™ will replace or repair any defective products without charge so long as the damage does not arise from improper, inadequate or incorrect usage.